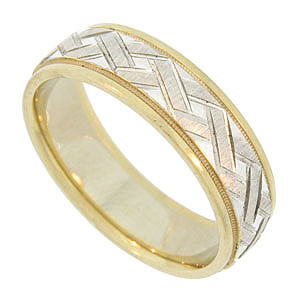 This handsome 14K bi-color wedding band features a central band of white gold engraved with a squared off woven design. The woven stripes feature a roughened texture and are outlined in deep jewel cut engraving. 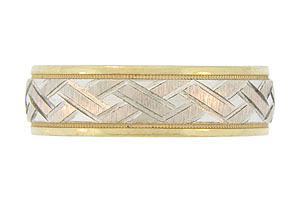 Yellow gold bands engraved with impressed milgrain frame the woven band. The wedding ring measures 6.65 mm in width. Circa: 1960. Size 10 1/4. We cannot re-size.